When choosing children's church bulletins about Thanksgiving, keep in mind that the most effective bulletins are biblically based, age appropriate and lend themselves to creating fun and engaging activities for any church event. The content is carefully designed by using proven educational methods and enthusiastically endorsed by Christian educators and pastors of all denominations. Because our bulletins teach basic Scripture knowledge, not doctrine, they're perfect for all churches. When children are given a bulletin of their own each week, they get excited about Sunday school and know that worship is for them too. 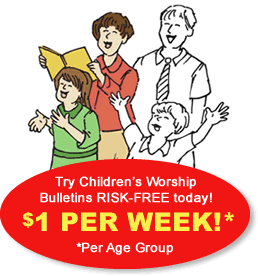 Children's Worship Bulletins are developed for two age groups, 3-6 and 7-12. Bulletins for each group are completely customizable, so you can add your church contact information, including address, phone number, website, pastor's name and logo. Children's Worship Bulletins make it easy to create fun and engaging activities for any church event. In this short article, we will show you how to use two of our children's church bulletins about Thanksgiving to create imaginative activities for children ages 3-12. These ideas are perfect for Sunday school or any other church activity in which you want to teach biblically based lessons about Thanksgiving. Children's church bulletin about Thanksgiving for ages 3-6: This psalm says, "I will thank God for all things." Give everyone a bulletin and pencil and have them complete the puzzle "This psalm says, 'I will thank God for all things.'" When everyone has finished the puzzle, have a helper distribute a pair of scissors, a glue stick and both the Blessings Tree and labeled leaves handouts to everyone. Explain the activity, "The psalmist tells us that we are to thank God for all things. Today we're going to create a Blessings Tree." Continue, "First, let's read some of the blessings God has given us." Read aloud the blessings printed on the labeled leaves handout. Continue, "Next, we need to create our Blessings Tree. On your "Blessings Tree" handout, draw the trunk of a tree with bare branches." Show your sketched example. Continue, "When you have finished drawing your tree, color the leaves and cut out each. Glue them to your tree to create your own Blessing Tree." While everyone is working on their project, read aloud Psalm 138:1-8 to reinforce the lesson. Children's church bulletin about Thanksgiving for ages 7-12: What does the psalm encourage us to do? Give everyone a bulletin and pencil and have them complete the puzzle "What does the psalm encourage us to do?" When everyone has finished the puzzle, have a helper distribute a pair of scissors and three sheets of construction paper in different colors to everyone. Place the cookie cutters in the middle of the workspace for everyone to share. Explain the activity, "The psalmist encourages us to rejoice by giving thanks every day. Today we're going to create a Blessings Tree. Using a cookie cutter, trace a leaf onto one of your sheets of construction paper. 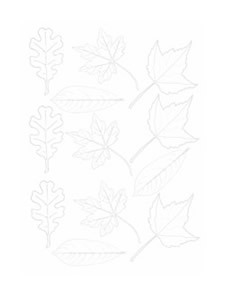 Write something for which you are thankful onto the leaf shape, and then cut out the leaf. 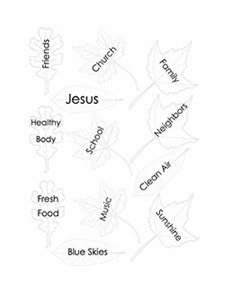 (Show the example Blessing Leaves you created, and suggest a few ideas that the children can write on their leaves.) Create at least three leaves for our tree." While everyone is working on their leaves, read aloud Psalm 118:1-2 and 19-29. After everyone has finished, ask for a volunteer to share what he or she has written before attaching his or her leaves to the tree with tape. This activity can easily be adapted to prepare children for Thanksgiving over several weeks. It may be helpful to cut out several leaf shapes in advance so that children just have to think of and write their blessings on the prepared leaves. Attach the Blessings Tree to the wall approximately six weeks prior to Thanksgiving and have children write their blessings on their leaves at the beginning or ending of class each week until Thanksgiving. Use the time that they're writing their blessings to review or memorize the Scripture, "This is the day that the Lord has made. Let us rejoice and be glad in it. —Psalm 118:24"